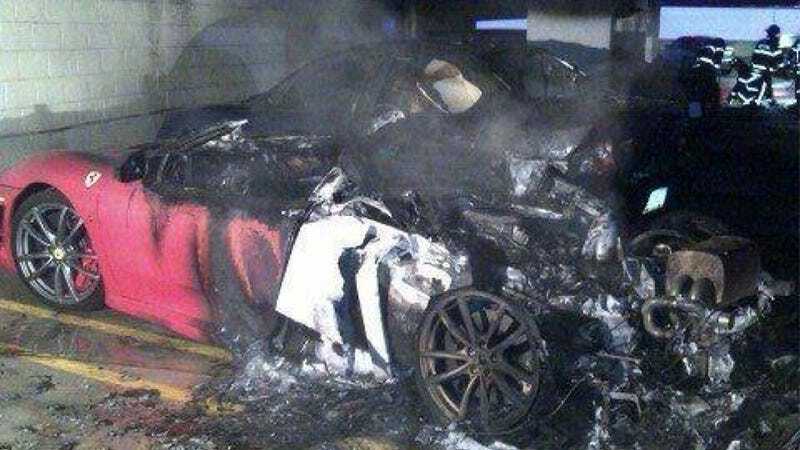 Once again, a Ferrari has met its end at the hands of its most persistent enemy: fire. This time the culprit caught up with its prey in a Pennsylvania hospital parking garage. Local news source Levittown Now reports the Ferrari (which we think was an F430, but it's not easy to tell here) was parked in the first-floor doctor's parking lot at St. Mary Medical Center in Middletown Wednesday night when a conflagration occurred that consumed it and a more "modest" vehicle. The report says the fire started in one vehicle and quickly spread to the other one, but it doesn't specify which car the blaze originated from. Who knows, maybe the fire didn't start in the Ferrari this time? Stranger things have happened. While ambulances were diverted from the hospital for a time while crews were putting out the fire, no one was injured in the actual garage fire, so that's good news. Fire. It just seems to follow these things wherever they go.